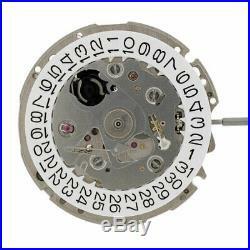 Seiko NE15 Automatic Watch Movement 3 Hands For SARB Models Replace 6R15 New. COMES IN THIS MODEL NUMBERS. SARB047, SARB059, SARB048, SARB049, SARB053, SARB057, SARB061, SARB077, SARB075, SARB063, SBDC001, SBDC003, SBDC005, SBDC007, SBDC009, SBDC017, SBDC019, SBDC023, SBDC025, SBDC027, SBDC029. SBDC031, SBDC033, SBDC037, SBDC039, SBDC041, SBDC043, SBDC047, SBDC049, SBDC051, SBDC057, SPB029, SPB031, SPB051, SPB053, SPB055, SPB057, SPB071, SPB077, SPB079, SPB081, SZSC004, SZSC005. I should be able to resolve most problems. Only excepted if the item is found to not be authentic. All items are authentic and the condition is as described. If you have any questions or need any additional pictures, please let us know. Thank You for Viewing our Listing. 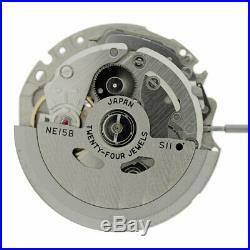 The item "Seiko NE15 Automatic Watch Movement 3 Hands For SARB Models Replace 6R15 New" is in sale since Wednesday, March 27, 2019. This item is in the category "Jewellery & Watches\Watches, Parts & Accessories\Parts, Tools & Guides\Parts\Movements". The seller is "swisspartsaj" and is located in Springvale, VIC. This item can be shipped to Australia, all countries in Europe, all countries in continental Asia, United States, Canada, New Zealand.